Should you attend? Yes! If you formally or informally take the lead within any activist group committed to responsive, responsible and civil representation and legislation, you’ll benefit from this Summit. • Event: 10:00 am to 4:00 pm. After-party: 4:00 pm to 6:00 pm. 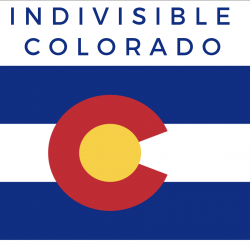 *Indivisible Colorado is a grassroots coalition of people in resistance groups across Colorado. We share a passion for activism and the strong belief that we will dramatically increase our impact and create lasting, positive change through communication, education, and human contact. 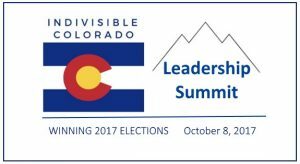 **Strengthening Democracy Colorado is a 501(c)(4) non-profit. As such, contributions to it are not tax deductible. Certain information about your contribution may be disclosed as necessary to comply with applicable law.